Habbo Club (HC) is an addition for regular Habbo users to buy to upgrade their account and gain access to exclusive features. Habbo Club at the time cost 25 credits, and previously only 15 credits during the revival of HC for one months subscription. There are occasionally deals which offer discounted prices for Habbo Club subscription during events and seasonal occasions such as Christmas. Habbo Club was discontinued on the 30th of November 2011 so that Habbo could focus sales on Habbo VIP. On the 16th January 2013 under new staff at Sulake, Habbo Club has returned again, taking over from Habbo VIP with the promise of new gifts, badges and hairstyles. Habbo Club was first established in December 17th 2002 at a price of 25 credits, and underwent numerous major changes over the years. The introduction of Gold HC came not long after it was first introduced, in order to add an incentive to those who finished their first year of Habbo Club. Gold HC was issued to a member after 12 months of regular HC membership (the badge received at the beginning of the thirteenth month), and it consisted of a golden variation of the HC badge which had animated sparkles and replaced the users old HC Badge. The biggest change to the Habbo Club system came in Version 12, which included a whole new series of Habbo Club gifts, increasing the previous rotation from 12 months to 23 months. Upon the addition of these new gifts, the valuation of Rares went haywire as 12 rares were released simultaneously. For example, the Habbo Butler was valued at several thrones in the first few days. Whilst the prices of these Rares have since dropped, they have not lost their charm. Later on, when Badges were expanded, more stages of Habbo Club badges were added for each month. Habbo Club Gifts were given out via presents to the users Hand or the more recent Inventory. With new updates and the catalogue becoming more versatile and the introduction of VIP, Habbo Club Gifts were available for selection each month in the catalogue and are unlocked with each passing month for selection of a gift. Eight exclusive new room layouts. Some of the rooms come with a set of stairs and additional levels to add more to your room. Bigger selection of clothing styles and colours, the ability to mix and match colours, and saving outfits for future use. An extended limit of friends on the Friends List (non-HC members can't have more than 300 friends on their list while HC members can have 600). HC badge received to show off their membership. Can use the :chooser and :furni commands to list the other users in the room (:chooser) and to list all furniture in the room (:furni). Furniture is available as a reward for being part of the Habbo club. Below is a list of the furniture that was available and their current price and month available. Month 12 would reward the user with a gold Habbo Club badge and a Mochamaster, repeating the gifts following continuously. These Habbo Club gifts were added to convey a two year plan of Habbo Club. This enticed users to stay on for longer to reap the rewards of being a member for 2 years. The table shows the months that these gifts were implemented into within the previous range. 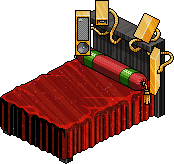 During the era of HC/VIP, this new aesthetic of furniture was released in the Habbo Club Gift Shop. This was to entice users away from the classic look of Habbo Club Gifts. This caused a divide in opinion and many users were unhappy with how Habbo Club had changed and it was later reverted in the 4th generation of gifts, which saw the re-introduction of the original style of Habbo Club. 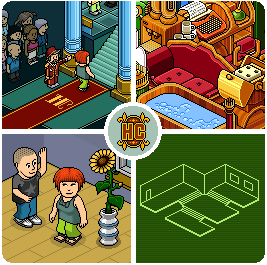 Below you can see all five pieces of furniture that were released into the Habbo Club Gift section early 2013. These items were implemented with other previous gifts. Below you can see all eleven pieces of furniture that were released into the Club Shop December 2013. These are a re-coloured version of the Executive range. This was a re-coloured version of the Alhambra furniture line for the Habbo Club gifting system. It featured 10 different furni released in December 2014. This was a re-coloured version of the Bling furniture line for the Habbo Club gifting system. It featured 12 different furni and was released December 27, 2017. The 9th Generation of gifts featured 12 statues of the zodiac signs. It was released in December 2018. Before the Club Sofa existed, it was branded as the Mountain Dew Sofa, which later evolved for Habbo Club. Originally, the reward for the second month of Habbo club was a unique colour of Plasto (Plastic) furniture, a shade of bright cyan blue. It was infamously unpopular, and as such, was removed as a reward upon the addition of new rewards in Version 12. Despite the Habbo Club rewards being in a rotation, it was never possible to gain a second Habbo Club sofa as it was absent from future rotations. The reasoning behind this is unknown, but it may have been an attempt to make it more exclusive, or perhaps to keep it at a stable value as it was an integral part of the Habbo economy. This page was last edited on 30 December 2018, at 10:22.